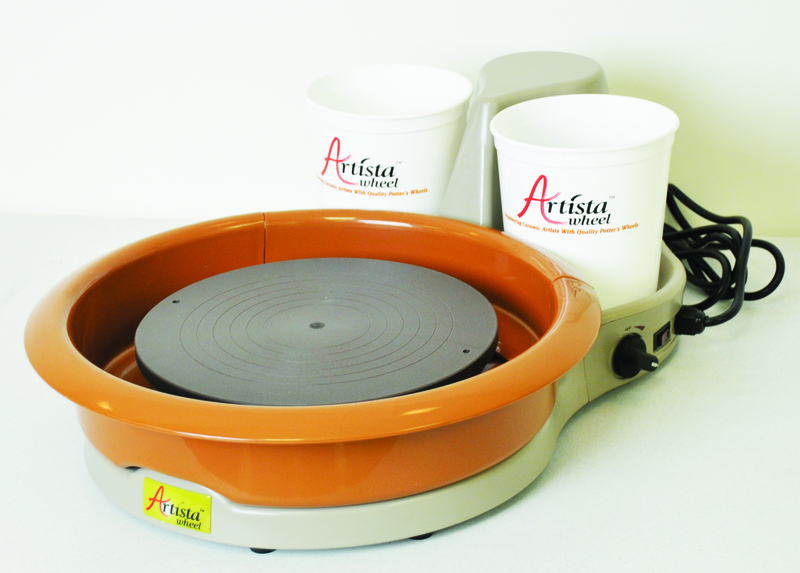 Combining convenience with quality, power and capacity, the Artista Potter’s Wheel has it all! This lightweight wheel’s compact construction makes it portable and easy to store. Artista’s 25lb centering capacity makes it a great fit for any studio or classroom. With an 11” wheel head, 1/3 HP motor that runs smoothly with very little noise, variable speed hand control (0-220 rpm) and a two-part splash pan (included), the Artista leaves little to desire in performance, quality and value. 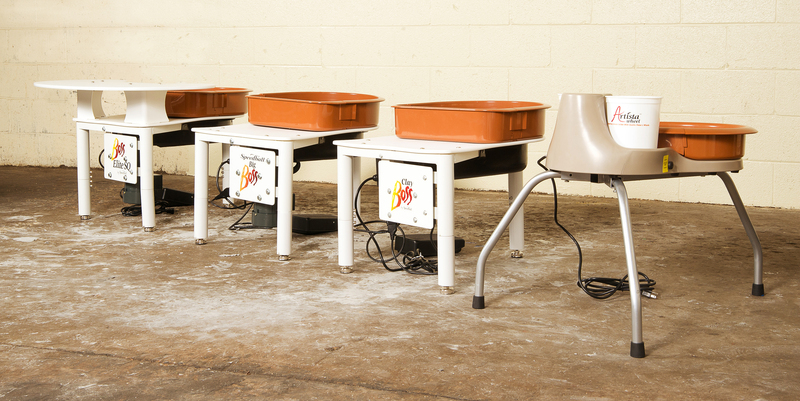 For artists who want to move from the tabletop to the floor, static or folding legs can also be added, and for artists who prefer, the Artista can easily be converted from hand-operated to foot-powered with our plug-in foot pedal. Available in standard and left-handed models, this potter’s wheel also comes with (2) free bats, an instructional DVD and a 2-year warranty. Boasting a 10-year warranty, the Speedball Boss Series of pottery wheels offers the same high-quality performance of other wheels at an exceptional value. Possessing features and capabilities that artists demand at a price that can’t be matched, these wheels are the new industry standard. Each wheel also includes (2) free bats and an instructional DVD. Clay Boss® Wheel: With a .5 HP industrial motor and 100lb centering capacity, Clay Boss has quickly become one of the most popular wheels on the market today. The Clay Boss features a polyethylene tabletop and two-part splash pan for easy cleanup, 14” wheel head and foot pedal with smooth, variable speed control (0-240 rpm). Its reversing plus allows for quick and easy changes of wheel direction, and its sophisticated load-sensing control ensures that the wheel head speed is maintained under changing loads. 10-year warranty. 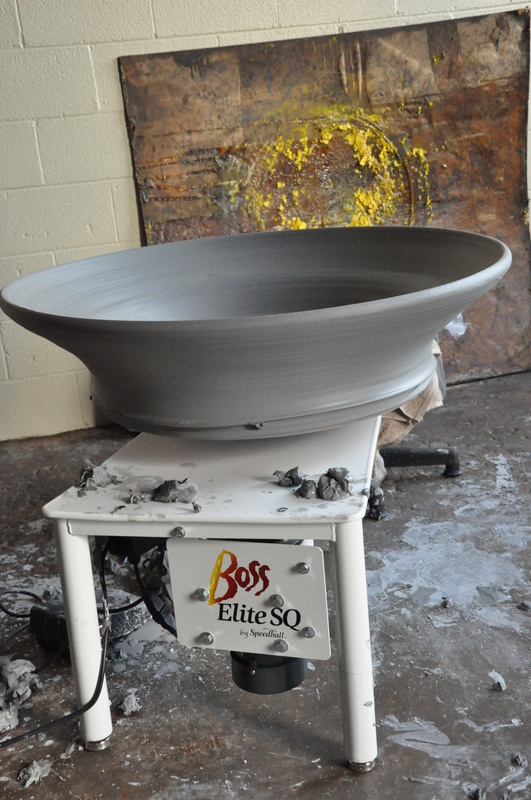 Big Boss Wheel: Ideal of potters working with large form, Big Boss features a 1.0 peak HP rated industrial motor that runs quietly as it handles up to 175lbs of clay. Its 14” wheel head with variable speed control (0-240 rpm) remains smooth and constant under varying loads, and the Boss’ reversing plus allows for quick changes to wheel head direction. For even greater ease of use, Big Boss contains adjustable glide feet to allow for changes in wheel height or leveling on uneven floors. Also includes foot pedal and two-part splash pan. 10-year warranty. Big Boss Elite SQ Wheel: Provides artists with the same quality performance offered by the Big Boss, but also includes a convenient polyethylene utility shelf that can be adjusted to two positions. 10-year warranty. Watch Speedball Professional Artist, Jeff Blandford, highlight the large-scale performance capabilities of the Big Boss as he throws 175lbs. of clay. Want to see this live? Come visit our NCECA booth where Jeff pushes the Big Boss to handle 225lbs—now, that’s one big bowl!